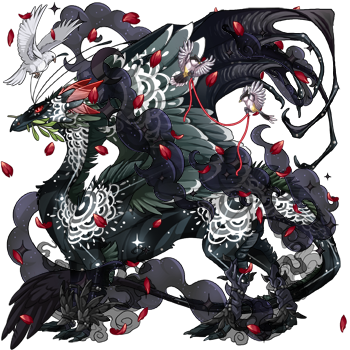 Decorative frill patterns are beginning to materialize on dragons across the realm. 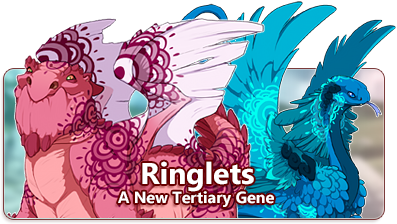 A new gene, Ringlets, is now available in the Treasure Marketplace! Click here to learn more about this update. Today we've launched our newest tertiary gene: Ringlets. This versatile gene adds bursts of colorful rings to a dragon's neck, wings, and back. Ringlets is available now in the Treasure Marketplace. A scroll that will change the tertiary gene of one dragon to Ringlets. This item can only be used once and will disappear after it has been applied. Y'aaaarrrrr! Our swarthy collection of corsair apparel has cycled back into the gem marketplace for a limited time! Grab yourself a set of this piratical garb from now until Friday, September 21st at 22:00 server time. A beaten, leather cap sporting a dashing red feather. It is crackling at the edges and smells of saltwater and fish. Y'arrrr! A beaten, leather cap sporting a dashing white feather. It is crackling at the edges and smells of saltwater and fish. Y'arrrr! A beaten, leather cap sporting a dashing black feather. It is crackling at the edges and smells of saltwater and fish. Y'arrrr! A beaten, leather cap sporting a dashing purple feather. It is crackling at the edges and smells of saltwater and fish. Y'arrrr! Many dragons that have perfect vision wear this eye patch to simply make a fashion statement. Restrictive eyewear is in this season. A tattered cloth, torn off somewhere during a recent plundering. What an awful pattern. A stiff overcoat edged with a fanciful trim. This cutlass is used more for decoration than anything else. It is worn, dented, and rusting along the blade. This cutlass is used more for decoration than anything else. A pair of cracked leather swashbuckler boots. They are faded from many days in the sun. A bundle of the entire Corsair's Seaspray Set. Includes Cap, Kerchief, Eye Patch, Cutlass, Overcoat, and Boots - A savings of ten percent! A bundle of the entire Buccaneer's Seaspray Set. Includes Cap, Kerchief, Eye Patch, Cutlass, Overcoat, and Boots - A savings of ten percent! A bundle of the entire Privateer's Seaspray Set. Includes Cap, Kerchief, Eye Patch, Cutlass, Overcoat, and Boots - A savings of ten percent! A bundle of the entire Swashbuckler's Seaspray Set. Includes Cap, Kerchief, Eye Patch, Cutlass, Overcoat, and Boots - A savings of ten percent! Encyclopedia page titles are now shown on browser tabs. The name of a thread will now display in alerts notifying players that they were pinged within them. It is now possible to open the Preview Familiar window from many more areas of the site. The recipes list for Baldwin's Bubbling Brew now has improved search and filter options. It is now possible to initiate a Crossroads trade directly from a player's clan profile. It is now possible to embed outfit BBCode within clan profiles and dragon profiles. The Dressing Room has received significant changes to allow for better apparel searching, filtering, and the ability to add more than one item at a time. It is also possible to hide pieces of apparel from view within the outfit editor. If you're wondering whether or not you should ping me for something, go ahead—I don't mind! Wanna take part in the 2019 Joint NotN Mass Hatch?